BARCELONA, SPAIN – Amid its usual over-the-top Unpacked event at Mobile World Congress, Samsung unveiled its latest flagship smartphones, the Galaxy S7 and S7 Edge. And, with a little help from Facebook founder Mark Zuckerberg, Samsung introduced its first consumer 360-degree VR camera, the Gear 360. In many ways, the 5.1-inch S7 and 5.5-inch S7 Edge are upgrades rather than a whole new device compared with last year's cosmetically similar S6 and S6 Edge. The headline changes are upgraded cameras (12MP rear, 5MP front), now better designed for low light performance. Helping to brighten things up in dim conditions, both forward and rear have super-fast f/ 1.7 aperture lenses and 30 percent larger pixels than on the Apple iPhone 6s. The camera also uses phase-detection autofocus; each image sensor pixel includes two "eyes" to freeze focus on fast-moving objects, especially in low light. Samsung also has added Motion Panorama, a riff on Apple's Live Photo feature, that adds a bit of action when you scan across a panoramic scene. Panorama photos also retain a full-frame aspect ratio, rather than the usual thin-strip effect. Citing the fact that the average smartphone owner checks his or her phone 150 times per day, Samsung will have an always on display, which owners can configure. Whether it's your calendar appointments or the time, among other options, you won't have to lift a finger to check. And, the phone is smart enough to know if it's turned over or in your pocket, in order to save on battery life. Samsung also touted a 30.4 percent more powerful processor and a 60 percent for powerful graphics processor, with higher capacity batteries – 3000 mAh and 3600 mAh on the S7 and S7 Edge respectively. While no precise talk/play times werecited, the company noted you'd be able to binge watch an entire season of "Game of Thrones" on a single charge. Both phones feature wired and wireless Fast Charging options, which cut charging times in half; the wireless charging pad will be sold separately. For gamers, the new Galaxys also include the multi-platform Vulkan platform graphic interface. This enables a number of control and customization features, such as blocking calls during play and recording your game experience. Spec-wise, both new phones will run Android 6 (Marshmallow), are powered by quad-core 2.15GHz plus 1.6GHz processors with 4GB of RAM, include 32GB of user storage. Samsung has added back in expandable memory, missing from the S6 phones, in the form of an external hybrid SIM card tray that also can accommodate an up-to 200GB microSD card. Both phone also are IP68 rated, which means they can be dunked in up to 1.5 meters of water for up to 30 minutes without damage. The S7 will be available in Black Onyx and Gold Platinum, the S7 edge in Black Onyx, Gold Platinum and Silver Titanium. You'll be able to pre-order both phones on Tuesday, February 23, 2016, and see them in Best Buy and other U.S. retailers on Feb. 26, 2016. Phones will be available from AT&T, Sprint, T-Mobile, U.S. Cellular and Verizon on March 11. Bolstered by a surprise appearance by Facebook founder Mark Zuckerberg, Samsung announced its first consumer 360-degree camcorder, the tennis ball-sized Gear 360, due to go on sale this spring. No pricing was announced. 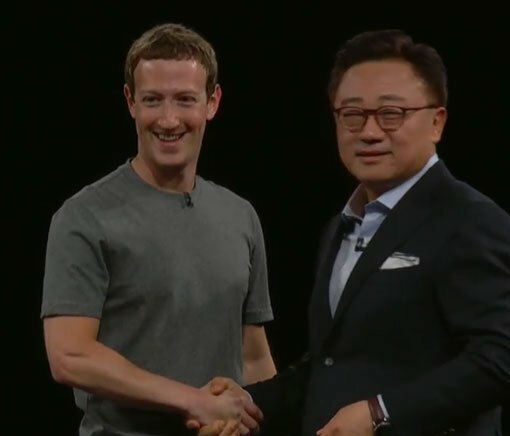 Zuckerberg noted that Facebook was investing heavily in VR – it bought Oculus two years ago for $2 billion – and proclaimed that "VR is the next platform," the next social platform. Zuckerberg noted that more than 1 million Facebookers a day are watching VR content on the social media site's 360 Video page; "our community already loves 360 videos," he noted. 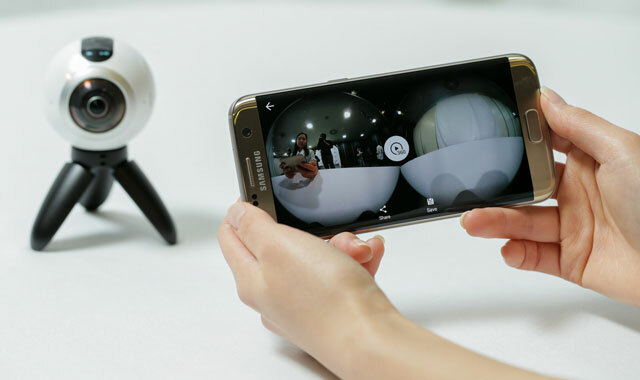 Twice during the event, attendees were prompted to done a pair of Gear VR goggles to view special VR presentations of the phones and a 360-degree soccer dribbling exhibition video shot with the new Gear 360 camera. Like many consumer VR cameras, the 5.4-ounce Gear 360 will sport dual 15MP f2.0 fisheye lenses, one on each side of the ball. Video captured from each is then stitched together to create a seamless 3840 x 1920, 360-degree video; you'll also be able to shoot 39MP stills. You'll also have the option to shoot 180-degree wide angle video and images via just one of the lenses. And like all consumer VR cameras, you use your smartphone as the viewfinder, via the Samsung Gear 360 app for this camera. Included with the Gear 360 will be a small tripod that will be compatible with many currently available accessories and mounts. Until March 17, or while supplies last, those who pre-order an S7 and S7 Edge will get a free Samsung VR Gear headset powered by Facebook's Oculus VR software, a $150 value.